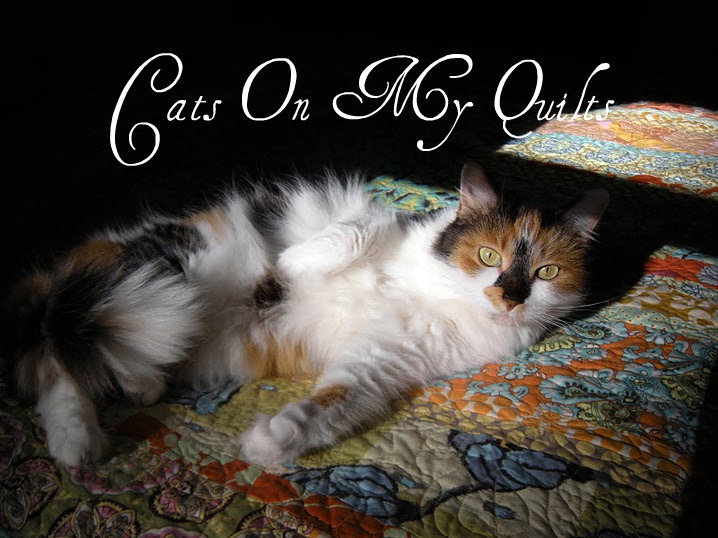 Cats On My Quilts: What's New? So what's new with all of you? It was an expensive week here with the refridgerator finally dying. I hated that thing and DH has accused me of sabotaging it but really, it kicked the bucket on it's own. Other than that it was time to clean off the cutting table and see what was hiding there. First layer revealed a bunch leftover fabrics that were originally a layer cake so I whipped up a little table topper. Then I found a Minick and Simpson Winter layer cake that I was going to make a Christmas quilt with but that never happenned so I may tackle that soon. I'll be so early for next Christmas, not late for this past one, the way I see it. Plus there was a Wiscasset charm pack in there too-don't know what I'll do with that. Did you know that we pass right through Wiscasset Maine on the way to our Maine cottage? It's a cute little town but the traffic is awful. Next I made a quilt block for a Quilts of Valor project that DH's secretary is part of, all with fabrics found on the table. And finally here's my cutting table and believe it or not this is cleaned up. I'm neat everywhere else but this table is never neat, although it is actually cleaned up here. By the way, I love this table. It's a pub table that I bought at a consignment shop and I highly recommend them. It's meant to pull up bar stools to but it's perfect height for my 5'6" to cut at. And as you can see you can stow a lot of crap underneath! This is the ugliest room in the house with it's original 60's vinyl flooring and grey paneling it's really groovy! An update is on the radar for this room. The turquoise chest in the background was my father's tool chest that I painted. Handy for storing things in and it's tall and on wheels. So maybe soon I'll be fixing this room up. First DH has to finish up an even uglier 60's bathroom. That project is going SLOW! Love your tabletopper - very sweet. I worked with Wiscasset yesterday; love that line. The pub table is a wonderful idea for cutting. Just the right height - I have a cutting counter (like a work bench) in my sewing room. Great idea to repurpose that table. Yes, taller is better for cutting, isn't it? And good for you in some finishing up stuff. I'm finishing my Mom's table topper Christmas Gift binding tonight while watching a game! Now I'm early, too with gifts! I'm glad to know that I;m not the only one who has project buried on their table. I just finished a wool wall hanging I've had for years. Your table topper came out really cute. I personally bought a new table and chairs after being flooded. So, we get it home, I'm standing by it and realize, yes, this is just right for fabric cutting. It's also a pub set, works awesomely. I have a couple extra folding stools I can use with it to seat 8, so it's very useful. My husband thought fabric cutting was on my mind when I bought it, but it was a bonus. My cutting table was from Ikea and the legs are adjustable which worked out great. Your table is much bigger. Love the table topper. Oh I love your tabletopper...Can't wait to see what the Wiscasset and Christmas grow into. Isn't it amzing what we find when we clear out our work space? Great tabletopper! My cutting area is a board - usually placed on a part of a desk. Love the pub table. The Ikea table with adjustable legs is a great idea too. I'll have to look into that since I usually end up with back ache if I cut fabric for any length of time. In the old days before I got a proper cutting table, I would cut fabric while standing at the kitchen counter. When we bought our present home, and I got my own designated sewing room, a cutting table was the first thing I bought for it. I spent the weekend cutting out fabric for three new quilts! I love cutting. I use to cut at my kitchen table before I made one of my extra bedrooms into a sewing room. I have a six foot long folding table that I use for cutting. 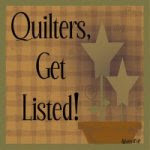 But I think I need to hire your reader Nicole, cause I hate the cutting part of quilting! My table is always cluttered with numerous projects that I have to clear off before cutting, hmm that's probably why I hate cutting. I guess the moral of my story is the bigger the table the bigger amount of clutter. I do believe you've seen my dining room....if you can find the table then I'll make you dinner! Hahaha! I guess that cute tabletopper isn't mine since I can find my table top. But I want to get the new machine set up, maybe Saturday! Perhaps I can help Dad finish up the bathroom and that would give me the knowledge I need to do something to my even older bathroom. Then I'll help with the sewing room this summer, a fun project! Nice pictures, and I love the new header too. This is a great post - says about the same as the way I store the leftovers from fabrics on the cutting table - which is a craft table with fold down sides, it is the perfect height for cutting and is on wheels so I can move it around if I need to. I work in my lounge room as I live alone and this is the biggest room in the place! Love that table topper! I also like your table for cutting. My dining room table has to double for me, as I have no other table. I would never show any of my little "Pig's Nest". It needs a makeover, and a cleanup!! Your pub table is a great idea, and thanks for sharing the picture. My work area was made by my father and is huge...and heavy. Just ask my husband as we have moved it several times and once had to take window frames down and just shove it through a double window. He made to custom fit for the basement room, and since then it has been moved upstairs and to two different rooms. Guess I need to take some pictures too. I love your table topper. I'm lucky like you and have a sewing room with a big cutting table. Couldn't live without it and was remembering earlier this week what it was like to cut out patterns on the floor without a large table. Ugh! I love finishing up a project and cleaning up the sewing room to get ready for the next project! I love to repurpose furniture. Most of my sewing furniture is repurposed, except for my cutting table. Like Wendy, my table is one from Ikea with adjustable legs. I originally had two of those tables (they're about 6' long), but it was too crammed with them. I took the second one apart, and didn't have anywhere to store the top, so my cutting table has a double top. I have a love/hate relationship with that table. It's still too big, but it's a perfect height and I can't afford anything new. My cutting table is home made. It is very nice but like yours it is full of stuff and I do need to clearn it up. One day soon I will get in there and work. I have a sewing room too. Don't use it that much. I will get back to it!!!! Sooo SOOO good to hear from you!! !